I have had a starling family as neighbours for a few days. We had a long weekend in our cabin, and just beside the cabin there is a large apartment complex. This consists of two old, half dead aspen trees. One of them has a lot of storeys with holes that have been occupied by generations of birds over many years. 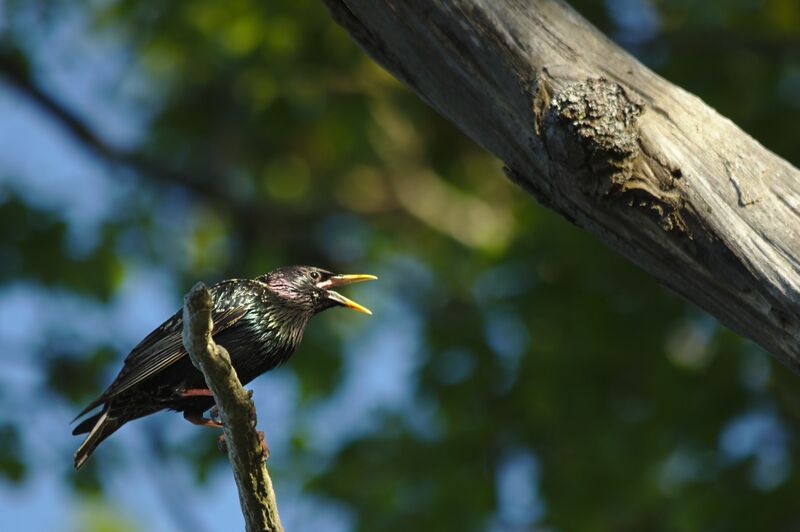 This time the top floor was inhabited by a starling family of four. At least I got to see four members of the family. The parents flew back and forth all day long with food for the hungry little ones. One of them often poked its head out to look for mum and dad. The other one was more reluctant, I only saw it when they got food. I had two places where I could sit and watch them with my camera ready. I could sit in a chair on the veranda below the hole. With my camera on a tripod this was quite comfortable, but it was low in relation to the birds and I also could only see the back of them sitting in the opening. The other place was inside an open upstairs window. The space was narrow and uncomfortable, but it was much higher and more to the side so it was easier to see both adults and kids. There was no room for my tripod, but one leg of my tripod is detatchable, and together with the center colomn and ballhead it makes a great monopod.